The CRE pump is a CR pump, motor and integrated variable frequency drive. The CRE pump is a system which is able to solve application problems and save energy. The basic CR pump range, which can be applied in almost any industrial solution, is already in itself the broadest range available. Through our modular approach, we have made it even broader. 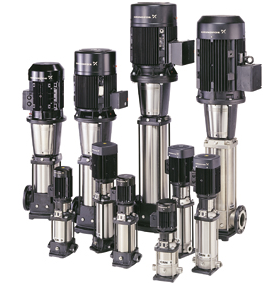 The Grundfos CR-H offers optimized duty points to maximize pump efficiency and minimize internal wear. The result? Significant reduction in energy costs, maintenance effort and downtime along with increased pump life. The horizontal multistage pump CM has been created with compactness and modularity as two of its central features, making numerous configurations possible. The pump is basically composed of a series of interchangeable modules, all of which have been designed to work together seamlessly, no matter what the application. The pumps are of the close-coupled type. The difference between the CM and the CME pump ranges is the motor. CM pumps are fitted with mains-operated motors, whereas the motors for CME pumps have an integrated frequency converter. 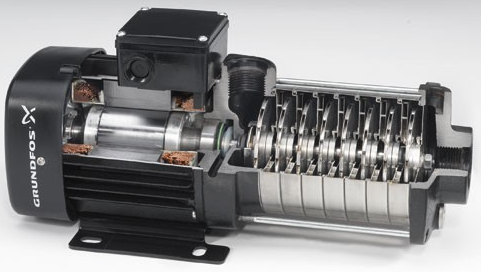 Both CM and CME pumps have mechanical shaft seals. 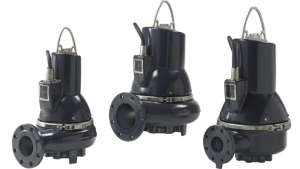 The CM and CME pumps are available in cast iron or stainless steel (AISI 304/DIN 1.4301 stainless steel, which is for water and non-corrosive liquids, and AISI 316/DIN 1.4401 stainless steel, which offers a high degree of corrosion protection against aggressive liquids). 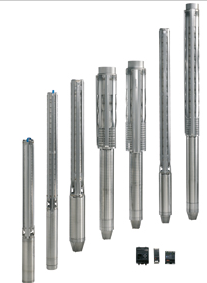 Grundfos MTR, SPK, CRK, and MTC pumps come with various pump sizes and various numbers of stages to provide the flow, the pressure and the length required. The MTR, SPK, and CRK pumps consist of two separate main components: The motor and the pump unit. The MTC pump is close coupled and the motor and pump end cannot be separated. 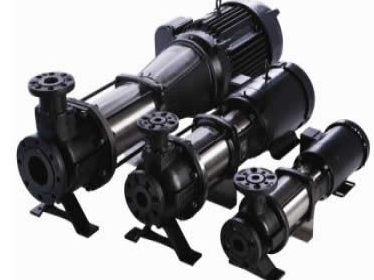 The SL pumps are designed to optimize the operation of a system. Reliability, simple service, and complete system compatibility are some of the main advantages. The Grundfos SP range offers high efficiency, high resistance to sand and other abrasives and easy maintenance. A complete monitoring and control system is available for constant optimisation of the pumping system. Grundfos high-pressure booster modules are used for boosting, liquid transfer and circulation in systems under high static pressure. Applications include reverse osmosis in domestic water supply, hospitals, laboratories, and the chemical, electronics and metals industries. The pumps are also used for ultrafiltration in the chemical and galvanizing industries, painting workshops, and the metals and mineral industries. Water treatment systems and Industrial plants. 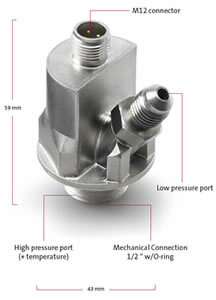 The pressure sensor efficiently combines pressure and temperature measurement in just one sensor. Transforming the pressure in and temperature of the water into electrical signals, the transmitter offers very accurate measurement in almost any liquid. The heart of the sensor is a coated SMART sensor, which transforms the pressure and temperature of the medium into electrical signals. These signals are calibrated, conditioned and presented in analogue or digital format by means of a microprocessor. The pressure signals are temperature compensated and linearised for the influence of temperature variations. Benefit from reliable differential pressure measurement with the unique direct transmitter that eliminates the need for pressure transmitters on both sides of the pump. The transmitter can be delivered as a combined differential pressure and temperature measurements in one. The heart of the sensor is a coated SMART sensor, which transforms the differential pressure (difference in pressure between the two ports) and temperature of the medium into electrical signals. These signals are calibrated, conditioned and presented in analogue or digital format by means of a microprocessor. The pressure signals are temperature compensated and linearised for the influence of temperature variations. On how to utilize the differential pressure principle, please see DPS under Products/Standards. 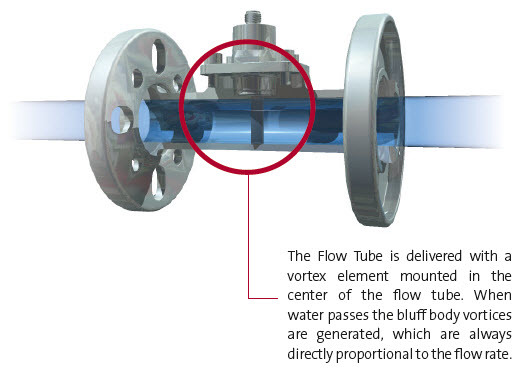 The flow transmitter successfully combines the established vortex principle with the patented Silicoat® technology. The result is an affordable and accurate direct flow transmitter designed for reliable operation in aggressive media. By combining the established vortex principle (von Karman, 1912) with the unique metal-glass coating, Silicoat® from Grundfos, an affordable, accurate and direct flow sensor for aggressive media is now available. The flow sensor is without any moving parts, which could deteriorate or commence clogging. The Vortex Street generates two series of turbulence (vortices) shedding behind a bluff body. By increasing flow the frequency of the vortices will increase and the frequency increases directly proportional to the flow in a full pipe. 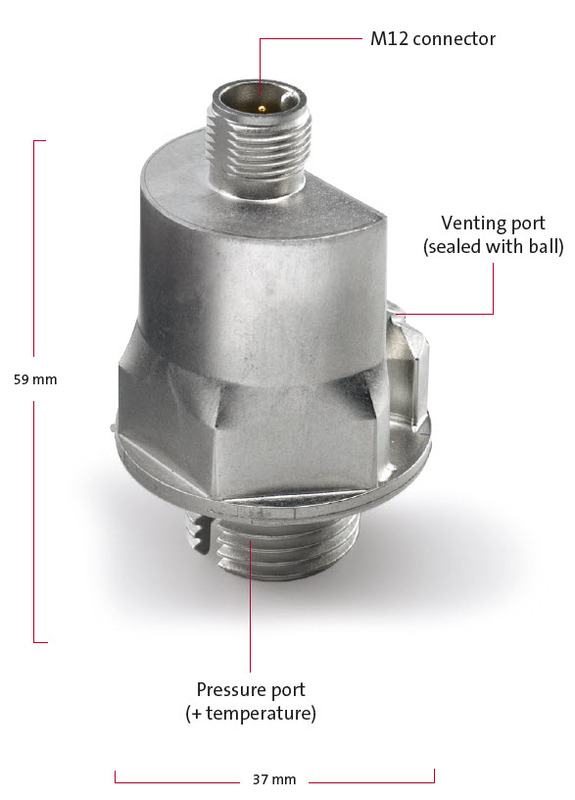 The Vortex Flow Sensor consists of a sensor, Vortex Tube and element. The sensor detects the pressure pulsation generated by the vortices, and converts the pulsation into an electrical output signal. The frequency of the pressure pulsation is a measurement of the velocity and in the defined flow pipe the actual flow is measured.